Installation shot of Beguile: James Carl and Lyn Carter at the MacLaren Art Centre, Barrie, Ontario. The gallery brochure calls it “contemporary post-minimalist sculptures…” Me? Well, I just call it good. “It” would be the exhibition Beguile: James Carl & Lyn Carter currently showing at the MacLaren Art Centre in Barrie, Ontario, about an hour’s drive due north of Toronto (www.maclarenart.com); and “it” may very well be contextualized within the realm of post-minimalism if you look at the work from a very narrow, very aesthetically specific angle. But looked at and thought of perhaps more broadly and meaningfully, it says something about the more everyday, far less rarified realm of textiles. Beguile is a small show – just two works apiece by each artist – situated in a relatively small exhibition space (small, but by no means crowded). But its impact is entirely out of proportion to the number of pieces that might be responded to, and to the size of the venue. But first: something about the artists. James Carl is a Toronto-based sculptor who’s exhibited in Canada, the US, and Europe. He first came to prominence in the 1990s sculpturally replicating high-end consumer products out of disposable stuff like cardboard. In 2008 he was the subject of a survey exhibition covering almost twenty years of his work. Based just outside of Toronto, Lyn Carter originally studied textiles at the Ontario College of Art in Toronto in the late 1970s, and has since exhibited her work world-wide. In 2012 she was herself the subject of a ten-year survey exhibition. Okay, then – about my argument for the centrality of textiles in Beguile. Certainly if you look at the work in the show solely from the perspective of medium and material, I’m only half-right. 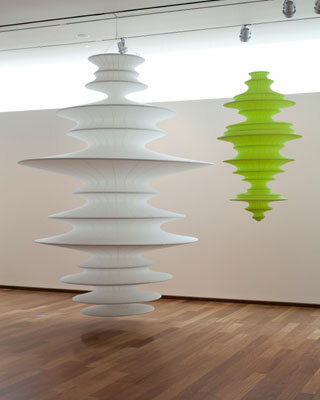 Lyn Carter’s two sculptures Bouquet (2012) and Beacon (model) (2011) are both comprised of textiles: nylon material that has been cut, sewn together, and then tightly stretched over armatures that are made of aluminum hoops of varying diameters stacked vertically atop one another, sculptures suspended from the gallery ceiling that exhibit a rotational symmetry centered about their vertical axes. The abstraction and symmetry of her work are both emergent from shaped textiles; medium and material are indeed key, here. But they aren’t the sum of the parts. Carter’s work isn’t held in self-reflective check by the imperatives of textiles, not entirely rooted in its own critical and material self-examination. Rather textiles opens to another direction opposite itself, serves another end; there is, for example, the intense suggestion of enormous motion and energy in these works, the sense of these artefacts as rotationally spinning about themselves at velocity. At the same time, they oppositionally allude to fixedness; the resemblance to, say, ornate wooden table legs turned on a lathe cannot go unmentioned but also cannot and does not dominate these pieces. What seems critically important in them is the evocation of all that is transitional – of something aesthetically between. There is grace, here, in the fluent symmetry of two rising sculptural forms (here because textiles permits it) but too there is the fluid tension of something that is neither/nor. James Carl’s sculptures are anything but symmetrical. And rather than hanging suspended from the ceiling, they rest more conventionally on low plinths. Balanced, would be more like it. 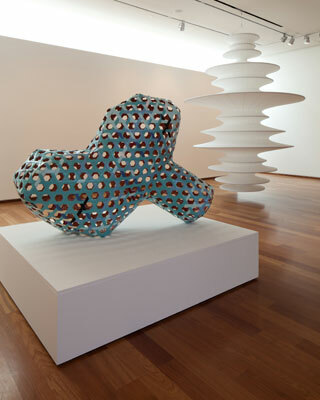 Carl’s pieces are lumpy, distended and asymmetrical, seemingly the antithesis of Carter’s cool aesthetic equilibrium. Seemingly. There is commonality – an important commonality. Textiles, of course, but not in a way you might expect. While Lyn’s work overtly encompasses the medium, Carl approaches it from another tack. Via Venetian blinds, actually. Over the past few years he’s been “weaving” sculptural pieces using the slats of Venetian blinds as his medium. Jalousie (1,3,5) and jalousie (1,3,2), both 2013 and part of an extended series, exemplify what Carl’s been up to. These are asymmetrical forms, lumpy, bloated distended sculptural artefacts that simultaneously suggest sluggish, inert mass and evanescent lightness. The woven slat weave of these pieces is visually porous; you can look clear through each of the works. They are volumetric forms, kinds of weirdly self-absorbing enclosed baskets, if you will, containing and shaping space but of themselves insubstantial. They flicker back and forth between corporeality and insubstantiality. They are neither/nor. But all the best, most interesting stuff is like that, isn’t it? Neither one nor the other? Flickering back and forth between two possible aesthetic cohesions? That’s what James Carl and Lyn Carter do – textiles and the sculptural shaping work that is not utterly one or the other. Somewhere and something in between. Both do remarkable work. This was a very curatorially sound exhibition.